When I was building my home automation (HA) system, the lack of devices and good integration between those devices was the main reason I settled on Z-Wave. In many ways Zigbee is a superior technology though, and also has the benefit of being supported by many chip manufactures (Z-Wave is controlled by Sigma Designs) so it’s great to see product announcements like this one by Kwikset and ipDatatel calling out explict support as part of a “Turnkey Security System”. I would love to see more of these, as well as a thriving DIY device & controller market for Zigbee. LAKE FOREST, CALIF. (July 5, 2013) – In a continuing effort to offer consumers locks that are a fundamental part of a complete security and home automation system, Kwikset announces a new integration with ipDatatel, an innovator in the telecommunications and security industry. As a result of the arrangement, the Zigbee version of Kwikset’s SmartCode™ deadbolt locks with Home Connect™ technology will now integrate with ipDatatel’s Gateway product. The Gateway — which boasts firmware that is 128 bit encrypted and password-protected — provides communication from the Internet to a variety of home systems, including HVAC, lighting, home entertainment, and more. The Zigbee version of the Kwikset SmartCode deadbolt locks with Home Connect technology are the first locks that work with the ipDatatel Gateway and capitalize on its home automation capabilities. 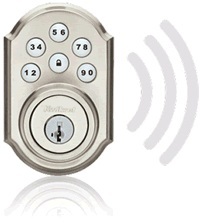 When connected to the Gateway, the SmartCode locks will offer homeowners their full array of security and convenience features, such as: remote locking and unlocking via smartphones and tablets; communication with other wireless products in the home; and receipt of text messages regarding lock status. A single Gateway is capable of managing up to five lock controls. Further, when ipDatatel’s Cellular Broadband Alarm Transceiver (BAT CDMA) is added, the SmartCode locks can be fully controlled through the home’s existing security system. This allows the homeowner to configure a wide array of customized security scenarios, including automatically locking the SmartCode locks upon arming the security system. ipDatatel’s BAT CDMA provides low cost “Dual Path” communications for alarm and home automation signaling via cellular and/or Broadband transmission. The BAT CDMA is extremely versatile, as it works with all alarm control panels that utilize Contact-ID to provide secure and cost-effective Dual Path – IP / Cellular alarm transmissions, virtual keypad, and notification. ipDatatel’s BAT CDMA product won Best in Residential Monitoring at both the recent ISC West show in Las Vegas and Electronic Security Expo in Nashville.